View a chart comparing all Lumenera Microscope Cameras here. Lumenera's Infinity 2-1R camera is a 1.4 CCD Digital Camera that connects directly to the computer through the USB port and includes software. 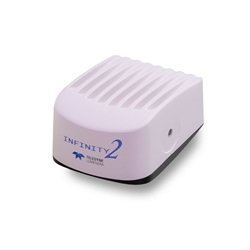 The Infinity 2-1R offers 1.4 megapixel CCD technology. This 1.4 megapixel CCD digital camera is a versatile solution for clinical, life science, materials science, and educational professionals working under low light conditions. With 1392x1040 resolution and on-board processing, this camera delivers outstanding image quality for a wide variety of scientific applications. Live video preview provides real-time focus and the auto exposure and auto white balance controls efficiently capture your optimal image. An intuitive user application provides camera controls while full integration to popular third-party imaging applications is available through our TWAIN drivers. The USB 2.0 digital interface ensures a simple plug and play installation – and one standard cable minimizes camera clutter. No framegrabber required. This camera is supported by an experienced technical support team and imaging experts. Camera mounts to a C-Mount on your upright, inverted, biological or stereo microscope triniocular port. 1.4 Megapixel color or monochrome progressive scan digital camera. 1/2” Interline Sony ICX205 CCD Chip. Captures images up to 1392x1040, 4.65um square pixels. Connects via USB 2.0 port - simple plug and play installation with only one cable, eliminates the need for a framegrabber. Select 8 & 14-bit pixel data modes. Ability to capture and save images as .jpg, .tif, .bmp or .raw file formats. RGB Data captured through each pixel contains 36-bits of color image information resulting in 4,096 intensity values. Full color sub-windowing allows for rapid focus and scanning of samples. Camera control through an intuitive user TWAIN interface allows easy integration to 3rd party software. Camera dimensions are 3.85" long x 2" wide x 2.75" high. View Lumenera Infinity 2-1R Datasheet. Included in the kit are the DK1-CCD Infinity digital camera, CD-Rom with Infinity Analyze and Capture Software, TWAIN driver, USB 2.0 cable and instructions. Windows 10, 8, 7, Vista, Mac OSX 10.7, 32 and 64-bit operating systems. NOTE: Microscope World has a restocking fee on this item, call for details.